Crème Brûlée is one of those desserts I always order out at a lovely dinner. I enjoy cracking the burnt sugar top to reveal that smooth and rich vanilla custard hiding beneath. 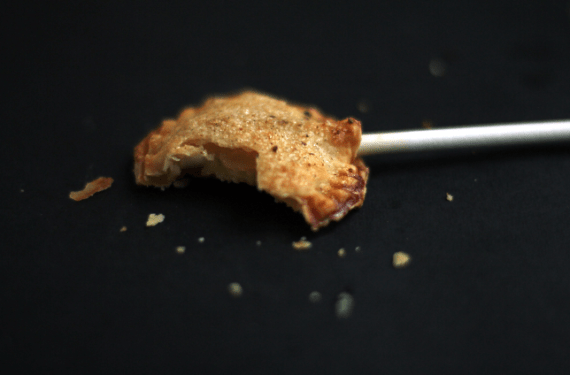 I knew it would be awesome if I could get the flavor I enjoy so much in the form of a pie pop. 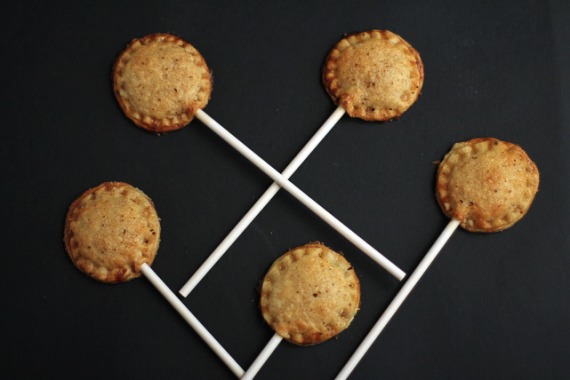 And so creme brulee pie pops were born. These creme brulee pie pops is a bit more refined for the adult who still wants that pie pop experience. It is filled with a silky vanilla custard done on your stove top. While you can’t crack the top open, I did duplicate the sugar top by sprinkling vanilla sugar on the top of the pop and broiling it for a bit to get that caramelized top we all love. I imagine this pie pop front and center at a dinner party or cocktail reception. It is grown up enough for your most sophisticated friends to enjoy. In a small pot, whisk together heavy cream, egg yolks, granulated sugar and vanilla extract over medium heat. Whisk in flour and continue to whisk the custard until it becomes nice and thick which can take up to 15 minutes. Do not stop whisking until it is done. Remove from heat and pour the custard into a small bowl. Allow it to cool and place in the refrigerator while you prepare the pie dough. For the Pie Pop assembly, Line a baking sheet with parchment paper. Begin to roll out the pie doughs on a floured surface to about 1/8-inch thickness. Using a 2 to 2 1/2-inch round cookie cutter, cut out 16 rounds, for 8 pie pops out of both pie crusts. Place each of the cut rounds on the parchment covered baking sheet. Next, place 1 tablespoon of the custard filling in the direct center of each of the rounds. Take a lollypop stick and place in the center of the round in the middle of the custard. Take the remaining rounds and place directly over the tops of the filling. Taking either a lollipop stick or a fork, seal or "crimp" the edges of the pie dough to seal the pops. Next brush each completed pie pop with the egg wash and sprinkle with vanilla sugar. 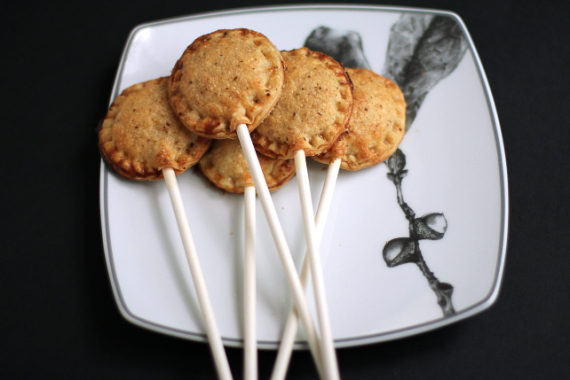 Bake the pie pops for 18-20 minutes. If the pie pops are not golden brown like the pictures above, turn on the broiler for a few seconds to really get the wonderful golden brown above. Let them cool for a few minutes before enjoying!! Um, LOVE THESE. The only thing that could make creme brulee better is…pie crust! Brilliant! Thanks so much Erika! I agree, pie crust makes everything better! You blew me away with these! A creme brulee filling? Brilliant! Wow, thank you so much Paula!! I’m dying over these!! They are so cute! Talk about sophisticated!!! How delicious these must be!!! Love them, Jocelyn! Happy Memorial Day! Thanks so much Carol!!! Enjoy your holiday weekend. These are so cute! Is it bad that I want to make them all for myself?! Nope not at all! I am the same way! Ohhhh these sound delicious!! I made pie pops once before and was in love with how cute they were, but only did fruit fillings. I have to give these custard ones a try! Yes, aren’t they the cutest thing ever??? What fun this would be at a dinner party! Creme brulee is my all time favorite dessert flavor, so I am excited to give this a try! Thanks,Jocelyn! Thanks so much! Isn’t creme brulee the best??? May I share it on my blog using the “Blog This” feature? Thanks so much Rekaya! Thanks for sharing! 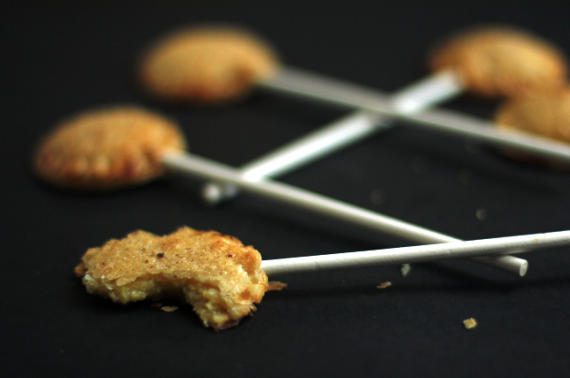 Oh my goodness, what an amazing idea for pie pops! Go ahead little miss baker extraordinaire… You are so talented and I’m so glad to have found your blog, Jocelyn! Thank you so much Georgia! That means a lot coming from you. I adore your blog! omg, I cannot believe you made creme brulee in lil pie pop form!! It looks amazing! Thank you so much! And they are my new favorite thing. I seriously eat too many of them! 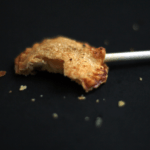 I love this pie pop streak that you’re on! Crème Brûlée is one of my top 5 desserts – these look (and sound) irresistible! Yes! I have been enjoying this pie pop week. And it is definitely one of my fave desserts too! Thanks so much! They are super tasty too!